Marvel is out to do something that no one has ever done before: translate the world of comics, whole cloth, to the screen. It has been methodically recreating superhero origin stories from its Avengers classic comics series since the first Iron Man movie in 2008. All this is leading up to an actual Avengers movie for next year. Given the unevenness of the movies so far, whether it will have been worth the effort remains an open question. The last – or most recent – superhero to have his origin story cinematized is Captain America, who also happens to be the oldest Avenger. Created during World War Two as a kind of Marvel version of Superman (that is, a classic square jawed, Nazi-pounding, muscle boy who seduces dames when not fighting evil and flying Old Glory), this 2011 version of that early Twentieth Century story seeks to recreate that all-American hero “on the nose,” as they like to say in Hollywood. On the nose – that’s the phrase that producers use about a screenplay when it telegraphs its intent all too clearly. In this case I use it to mean that this Captain America is about as sincere a recreation of that “aw shucks” all-American hero as one could seriously get away with in these post-modern, "Glee"-inflected times. Chris Evans shaves his oversized, well-oiled chest to give us a hero whose superpower seems to be male modeling and who gets in the requisite necessary beefcake shots (though clearly not enough to keep my interest in this movie). He smiles, jogs, and acrobats his way with affable enough likability through the film, though the plot that surrounds him feels like tissue paper manufactured solely for the purpose of his tearing gleefully through it. If you’ve seen the trailer, you’ve seen all you need to know about how he got those massive shoulders, although for some reason the filmmakers felt that what you got in twenty seconds in the trailer needed a good forty-five minutes in the theater (forty-five minutes of Evan’s training ritual would have been leagues more interesting than what we’re given here). The rotoscoping effect used to make Evans look puny in the opening sequences is the same one used to much more believability in Benjamin Button: here, it just seems like the actor’s stepped in front of fun-house mirror. Once the real beefed up Evan emerges, the story gets some legs (literarily), thought where it decides to go is hopelessly uninteresting. Some manufactured nonsense with Hugo Weaving as a Nazi spin-off (why not the real thing?) whose creation mirrors that of Captain America. Though the parallels could be interesting they are not explored: instead, we get a Force Ten from Naverone attempt to storm into the Nazi lair for the purposes of nabbing some “Warehouse 13”-like artifact whose abilities are never really explained. 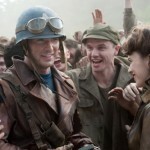 To say we’ve seen all this before would not be quite true because even in the most uninspired Indiana Jones flick we’re treated to a plot with more going on than this; Captain America exposes us to a new low in uninspired filmmaking. Only Evans and his – ahem – “acting talents” gives this film any interest. It’s a shame, really, especially after an entertaining Thor earlier this summer. Clearly we might have gotten a much better Captain America film than this, if only our luck with screenwriters and directors had held firm. Let’s just hope that for the Avengers movie, Marvel decides to lead with its A team.